Can software test automation ever replace manual software testing? Dion Johnson says no, but he does think it’s time that test automation is recognized as a mature discipline with its own body of knowledge. This ABOK allows test-automation professionals to hone their skills and provides organizations wishing to automate a pool of able resources from which to hire. Unfortunately, distrust is common in the relationship between managers and employees. But it doesn’t have to be. Taking the time to keep your communication path “weed free” by finding time for one-on-one communication, being open and honest, and listening to your team members’ input will cultivate an open, honest, and trusting culture within your team. If a tester is "somebody who knows that things can be different," then Marshall McLuhan was a tester par excellence. According to McLuhan, the English professor who proposed the Laws of Media, the message of a medium is not its content but rather its effects. Find out how this translates to software testing and how we evaluate requirements. With all of the resources available these days—books, blogs, Webcasts, training,—that aid us in our design, are you one of those programmers who lacks the "olfactory gene" needed to detect refactoring odors in your code? Unit testing helps you refine your sense of smell and improve your code design. From an experience with a testing buddy in a large organization, Julie Gardiner had a career-shaping epiphany. She discovered that understanding and applying formal testing techniques can help you grow as a testing professional, and she has incorporated that knowledge into her management repertoire ever since. Learn four ways you can get started using formal testing techniques with your team. Bring out the best in your code. Systematic code transformations are an important tool for test-driven development. Refactoring and generalization—common code transformations in TDD—improve the code while preserving its behavior and broaden the capabilities of the software. Each technique has its place, and together they help make TDD effective. Just because a metric is easy to capture doesn't mean it is useful. The metrics that are really needed are the ones that can help you make good decisions. Find out how to establish a project dashboard with meaningful metrics that will guide your project safely to its destination without getting bogged down in an endless pursuit of unnecessary information. One of the testing challenges we face is how to handle the large numbers of test cases we sometimes need to create and execute. 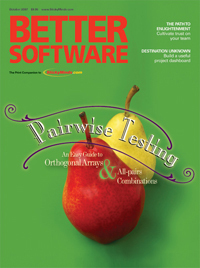 We can't test everything, but pairwise testing using orthogonal arrays or an all-pairs algorithm can help generate pair combinations that reduce the number of test cases we run while still finding a large percentage of bugs.